Presidential candidate Donald Trump sparked yet another backlash among his fellow Republican candidates Saturday when he said that Sen. John McCain was only considered a war hero because he was captured - and seemed to mock him for that fact. "He's not a war hero," Trump said at the Iowa Family Leadership Summit when moderator Frank Luntz brought up McCain, who spent more than five years as a prisoner of war in Vietnam. Immediately modifying his original remarks, Trump said, "He's a war hero 'cause he was captured. I like people that weren't captured, OK?" "Perhaps he's a war hero, but right now he's said some very bad things about a lot of people," Trump said. How will Donald Trump's comments on John McCain affect his campaign? Trump's comments continued a public spat with McCain, the 2008 Republican presidential nominee, which began when McCain said the business mogul had "fired up the crazies" when he held a rally in Phoenix last weekend. "This performance with our friend out in Phoenix is very hurtful to me," McCain told The New Yorker. Trump's seeming mockery of McCain's military record immediately drew nearly immediate public condemnation from some of his fellow GOP candidates, many of whom had just finished criticizing him for calling Mexican immigrants "rapists" and criminals. "Donald Trump should apologize immediately for attacking Senator McCain and all veterans who have protected and served our country," former Texas Gov. Rick Perry said in a statement, which also mentioned that Trump has not served in the military. "His attack on veterans make him unfit to be commander-in-chief of the U.S. Armed Forces, and he should immediately withdraw from the race for president." Enough with the slanderous attacks. @SenJohnMcCain and all our veterans - particularly POWs have earned our respect and admiration. I know @SenJohnMcCain. Senator John McCain is an American hero. Period. Stop. During an event in Sioux City, Iowa, Wisconsin Gov. Scott Walker said, "When it comes to attacking an American hero, I am going to call that out, and I denounce Donald Trump for that. He needs to apologize to Senator McCain and all the other men and women who have worn the uniform. That's just a disgrace." Ohio Governor John Kasich, who enters the presidential race Tuesday, also leapt to McCain's defense on Twitter. South Carolina Sen. Lindsay Graham, one of McCain's closest friends (McCain has already endorsed Graham for president) was asked by Luntz whether Trump's comments disqualified him from running. Graham responded, "I believe in democracy don't you? Let me tell you how it works, Frank. The good people of Iowa, the good people of New Hampshire, and the good people of South Carolina are going to figure this out. And here's what I think they're going to say: 'Donald Trump, you're fired.'" Ted Cruz did not talk about Trump at the Iowa summit and said he would not engage in personal attacks. While Trump did not apologize for his comments after the event, he sought to limit his message to McCain. "I am not blaming John McCain for his capture. If he gets captured, he gets captured," Trump told reporters after he left the stage. "Many people get captured. They are brave men because they are in the field ... I like the people who don't get captured, and I respect the people that do get captured." He also walked back his earlier remarks to say that "if somebody is a prisoner I would consider that person a war hero, but we have a lot of war heroes that weren't prisoners also, and we should give them credit too." Captured or not, all our soldiers are heroes! He also issued a follow-up statement through his campaign, though it did not mention McCain's war record. Instead, Trump said he was "not a fan" of McCain because "he has done so little for our veterans, and he should know better than anybody what the veterans need, especially in regards to the VA. He is yet another all talk, no action politician who spends too much time on television and not enough time doing his job." 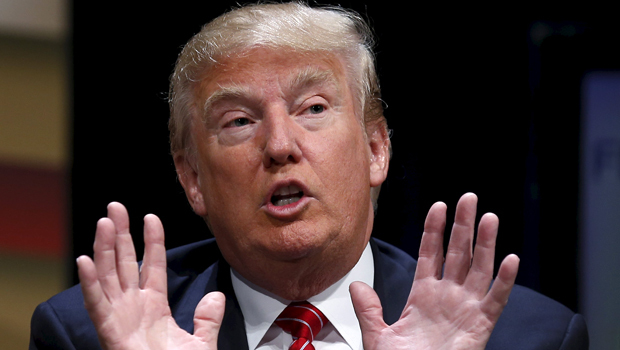 McCain's war record wasn't the only insult Trump hurled during the event in Iowa. He also said that he liked McCain less after his 2008 loss to then-Sen. Barack Obama, because "I don't like losers." And he said that McCain graduated "last or second to last" from the Naval Academy in Annapolis (McCain, in fact, graduated fifth from last). McCain was not his sole target at the event. When Luntz asked if Trump believes that President Obama loves America, he responded, "I don't know if he loves America. I hope he loves America. I don't want to get into that." And when Luntz asked if Mr. Obama was a moral president, he said, "I have no idea ... ask his wife." Killing ignites immigration debate over "sanctuary cities"
"I thought he'd be a good cheerleader for the country. He's been horrible. He's been divisive, he's been horrible. He hasn't even called Kate Steinle's family," Trump said, referring to the young woman who was shot to death in San Francisco by an illegal immigrant who had previously been deported five times. Trump refused to rule out an independent bid for president in response to a question by an audience member who said billionaire Ross Perot's 1992 presidential bid cost Republicans the 1992 election. "I won't go on record" ruling out a third-party bid, Trump said. "I want this country- this country has great potential, but soon it's not going to have that potential. We're being drained by incompetent leaders, by horrible people." He cited the recent nuclear deal with Iran as an example of a bad deal, criticizing Mr. Obama for leaving out four American hostages held by Iran. Luntz also asked Trump several questions about his religious views and pressed him on whether he has ever asked God for forgiveness. Trump said he is Presbyterian who attends church. As for asking God for forgiveness, Trump said, "I'm not sure I have." "If I do something wrong, I think I just try and make it right, I don't bring God into that picture," Trump said. "When we go in church and when I drink my little wine, which is about the only wine I drink, and have my little cracker, I guess that's a form of asking for forgiveness, and I do that as often as possible because I feel cleansed."